Hargate Hall is a large, architecturally-fine, country house set in over seven acres of parkland and situated near Buxton, in the heart of the Peak District National Park. Hargate Hall offers substantial accommodation comprising 12 self-catering apartments to suit either large or small groups, for holidays or short breaks, walking and activity holidays, or just ‘taking it easy’. Tariffs are available for weekends, midweek breaks or full week holidays. The Hall is also a popular venue for corporate groups, who conduct management-training and team-building events from this base. Those looking for a suitably grand location to hold a party, family get-together or wedding reception are welcome to enquire ahead about booking the entire building. 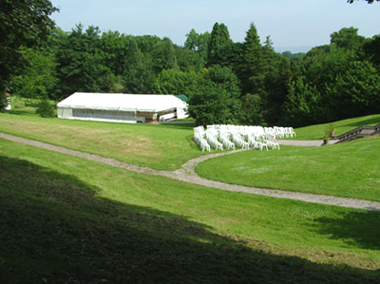 We are licenced to hold Civil Wedding ceremonies on site. The self-catering apartments are all equipped to a high standard with comfort in mind, and can accommodate from 2 to 10 people, or up to 79 people if all the apartments are booked. Each of the apartments has a fully-fitted kitchen area equipped with everything you would expect to find. They also contain TV, hi-fi and DVD players as standard, with larger apartments also including a dishwasher, plus a TV in the main bedroom. Cots and high chairs are available free of charge. All bed linen is provided and personal towels are available, if required, at an extra charge of £5 per person per week. Hargate Hall is centrally heated, all apartments having independent electric heating. Electricity is charged by £1 slot meter. Additionally, most apartments have an open fireplace. The Peak District was the first National Park to be established and is now the most visited in Britain. Miller's Dale and the Monsal Trail are just one and a half miles away from the Hall. The Limestone Way, also popular with walkers, is only half a mile away. In fact, visitors will find good walks in all directions starting from right on the doorstep. The Monsal, High Peak, Tissington and Manifold Trails - disused railways given over to walking and cycling - are all within easy reach. Some of finest country houses and historic sites in England are within easy reach of this base. These include Chatsworth House, Haddon Hall, Hardwick Hall and the plague village of Eyam. For visitors who like to keep active and healthy on holiday, there are excellent swimming and spa facilities in Buxton and an open-air pool in Hathersage. The self-catering apartments at Hargate Hall are located in a totally rural setting whilst being conveniently situated just a few minutes drive from the town of Buxton with its numerous facilities, and about 15 minutes from the market town of Bakewell. Castleton is just 10 minutes drive away and Matlock about 25 minutes by car. There are good bus services along the A6 to many more attractions, and a bus service that terminates at Tideswell, which you can catch just a few minutes away. For those who prefer train travel, the nearest railway station is at Dove Holes, three minutes drive in the other direction.